I had a fabulous weekend my friends. My nephew Ben was here from Connecticut for a Geo Conference that was put on by Google. They kept him busy most of the time he was here but we did get to see him during the day on Saturday before he left. We went wine tasting locally at Sarah's Vineyard and Kirigin Cellars . Then we headed towards Santa Cruz and the beach. We brought Ben by to see the Boardwalk, and took him around downtown for a bit, drove around and popped in to see my birthday sister Eileen at her beautiful vintage clothing store Ivy Company, grabbed a coffee at Verve all before we had to come back to drop Ben off. Ben brought a very special present with him, a birthday gift from my sister Jody at Couture Allure. I opened my gift to find these fabulous 1930s beach Pyjamas. Swoon. I tried them on and voila, they fit like a dream. I'm short and short waisted but I do love these so. The wide leg hemline is scalloped and trimmed with coordinating ivory fabric. 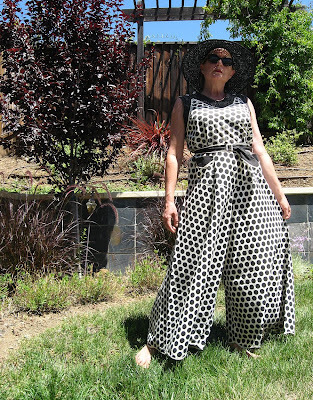 It's a black and ivory cotton polka dot and has sweet little pockets, it buttons at the shoulders with mother of pearl buttons and has a matching belt! 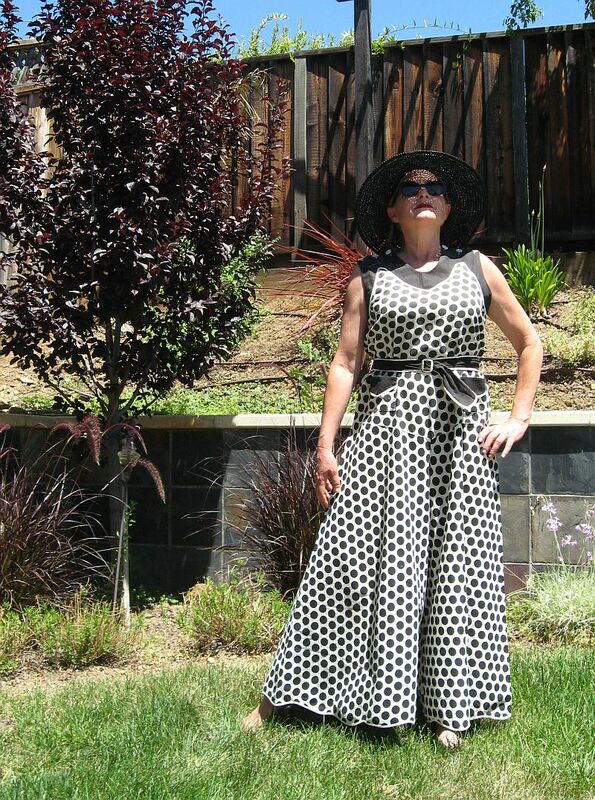 So this is me hamming it up in the back yard after trying it on. I'm on the lookout for some perfect shoes to go with this. Size 8 anyone? Ah yes, and some nail polish and maybe some pearls. And maybe a new hat. HA! Thank you Jody, I couldn't ask for a better sister! Mmmwha! That is just too fabulous, and it looks amazing on you! Coincidentally, I was just scanning a photo of some nearly-as-divine-as-yours beach pyjamas from 1930 I found in a book. I'll add a link when I get it online if you'd like to see it. Oh! it is so pretty! Your sister really knows you and gave you a very ncie gift! What a nice tactile link between sisters! Oh, they are just glorious!!!! SO chic! They are DIVINE! You're a lucky gal to have such a marvy sister! How sweet of her! They look great on you, especially with that wonderful hat!